My parents stayed with us for three weeks to help us take care of our newborn. 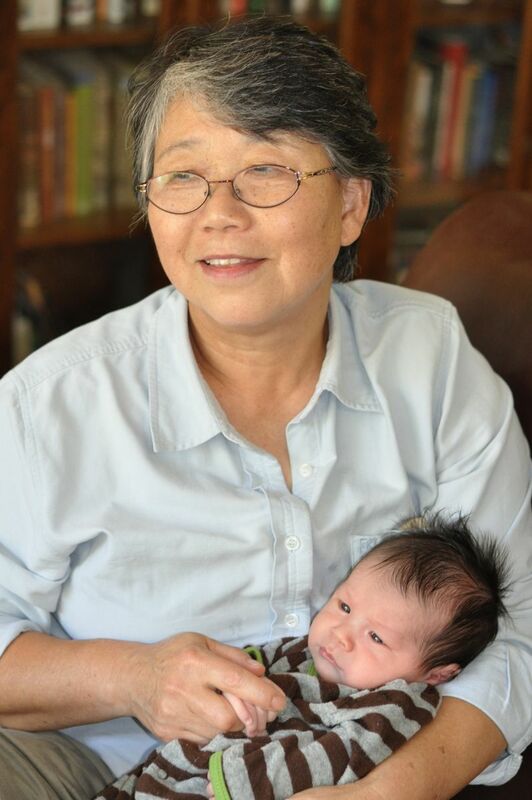 When I first asked her to help us out with our baby, my mom responded, "I think American babies are different than Korean babies." "American people take their babies outside right away. You would never do that with a Korean baby. American babies must be built stronger. I don't think I would know how to take care of an American baby." I didn't get into a discussion about whether our baby would be an "American baby" under her definition, but I tried to convince her that all babies are the same, even though I lacked the basis to make such an assertion. When my persuasive skills failed, we agreed that she would help with only the cleaning and the cooking. On Wednesday, the day before I was scheduled to be induced, my parents arrived from New York with enough food to last us through a nuclear attack. When they unloaded their suitcase, it spilled out with cellophane packets of dried-out seaweed, an assortment of dried fish, varieties of ground rice powder, sesame seeds, and other ingredients for postpartum concoctions. After unpacking, my mother marched into my kitchen and surveyed the cupboards, refrigerator, freezer, and pantry. "Where is the sesame oil? What about the soy sauce? You don't have ground red pepper? Oh, these? These aren't the right kind. Where did you buy these? We'll have to get some more. How old are these black sesame seeds? Get me a basket. A big one..."
After she cleared the counter, re-arranged the pots and pans, and browsed through the refrigerator, she grabbed the Swiffer and put the vacuum in my dad's hands. By the next evening, the floors had been vacuumed and mopped, the refrigerator cleaned, the ceilings cleaned of cobwebs, the laundry done, all furniture dusted, the floor mats dried in the sun, my plants thoroughly watered, and our yellow lab Sherlock's fur balls exorcised from all corners of the house. Early Friday morning, shortly after we called them from the hospital to announce the baby's arrival, my parents rushed over in a cab. After oohing and aahing over the baby and inquiring about my breakfast, they left the hospital in a cab. About five hours later, they returned, again in a cab, but this time bearing a pot of pine nut porridge. "I thought you told me the food was good at the hospital!" said my mother. "How come you ate only a bagel for breakfast? You can't breastfeed on a bagel." The next morning, they returned with a new pot of abalone porridge, more pine nut porridge, and two types of seaweed salad. "I wanted to bring seaweed soup, but I wasn't sure how to transport it..."
When we returned home from the hospital, we were greeted with balloons and a big pot of seaweed soup. During the next two weeks, I was mothered as I had never been mothered before. As soon as I stirred in the morning, my mother knocked on my door. "Are you ready for your breakfast?" By 6am, my mom and dad had already had their breakfast. By the time my husband and I woke up, fed the baby, and sauntered out of the bedroom around 8am, we would find my mother in the middle of cooking a second breakfast just for me. She would bring over a steaming pot of soup, a fresh cooked bowl of rice, a whole fish, and various other side dishes. "I cooked a separate pot of rice just for you. Dad and I'll eat the leftovers. You have to eat everything I cooked for you!" "But Mom, I can't eat all this food. It's too much." "You're nursing. You have to eat a lot. In Korea, you eat until you get sick and tired of eating. You eat for your baby. Tonight, remember you have to wake up in the middle of the night and have a snack. You can't go through the whole night without eating something. You can have some of the porridge I made for you." "Mom, I'm tired of eating. I ate non-stop for 9 months." "You do it for your baby!" When I ate, my parents hovered over me. They jumped out of their chairs if I needed to re-fill my glass of water or wanted to check on the baby. "You eat. You need to recover. I'll get it for you!" And for the meals we ate together, they brought over my food first. "You start eating. Don't wait for us. You have to eat when everything is hot. You are a mother now. You have to take care of yourself." It wasn't the usual order of things, not in our family where Confucian hierarchy was strictly followed, with the father served first and the youngest child served last. And it was unlike the kind of parenting I had seen for the past 25 odd years when I had felt more like a parent at times as we played out the drama of an immigrant family. When she wasn't cooking or washing the dishes or mopping or dusting or doing the laundry or weeding my garden, my mom held our baby. And I don't know how to explain how it felt to see my mother hold my baby the way she must have held me 38 years ago. To see her gently fold her arms around the child, to smile and coo at him, to wrap him in her love and to bestow all of her best of intentions on his well-being. To see her affection and tenderness spill out at his sight. She must have forgotten her protestations about "American babies" when she showed me how to bathe him, how to hold him when breastfeeding, how to massage him. Seeing her with him, I knew that I had been mothered in the best way possible. And that my child would be a part of this history -- of mothering skills passing from one generation to the next. What a sweet, sweet story. I'm so glad you were able to have such a wonderful experience with your mom upon the arrival of your baby - sometimes I think babies have a rather magical way of gracefully realigning people's relationships. Love the picture, too. Have you looked at Angie's List for help finding someone to clean for you? I wish you lived in SoCal - my housekeeper's sister is looking for work right now. You'll find someone wonderful, I'm sure. Hang in there! Shinyung, this essay brought tears to my eyes. I always love it when you write about your mom, and this was just lovely. The picture itself made me sniffle. I hope all is well. This made me cry. Your mommy loves you so, SO much. Hi Shinyung, so happy to hear things are going well with you and your recently expanded family! What a wonderful post. I know things haven't always been smooth with your family, but it is so great that you love and cherish your mother so much. My mother died on 9/11/07 (9/11 is just a terrible day for me) when I was 5 months' pregnant with my first child. When he was born I had a very difficult time without her. My mother-in-law did her best, but it just wasn't the same. On a different note, how did your parents do with Sherlock? This was a truly wonderful post. And what a beautiful mother. And a beautiful grandson. I hope that all of you will enjoy many many years of good health and happiness together. On another note,I too, just had my baby. In reading this, I felt happy for you and yet, selfishly, sad for myself as I don't have any family here to support me through this transition. It is just the two of us - my husband and I.
I do think that we need help and *much love* during the early months of motherhood. It is during these periods in one's life that one can feel truly connected to generations of women before, and all those yet to come. This is not a "project" to be handled alone. Thank you so much for continuing to post and share your wonderful experiences with those of us that have been following your blog since its inception. Your posts are an absolute joy to read, and the picture of your mother and your son is priceless. I wish you nothing but the very best, and I hope you'll keep writing here as time allows! This was a great post. My mother, who is the daughter of immigrants, totally mothered me when I had my daughters and in a way continues to. She cannot let me leave the house without food for the freezer and insists on cooking for us even months later. She also totally helped us with things like bathing, etc. Even though our parents are not from the same place, I think many people can recognize themselves in your post. I am sure your parents were thrilled you asked them to come and help. I love reading your posts about babies since I have a 4 month old right now myself. Good luck! I love reading your comments! They mean so much to me. Thank you for taking the time to write your responses/feedback. Bria -- I haven't checked out Angie's List but I will! Aryn -- I'll be sure to post about how my parents dealt with Sherlock, but things worked out great. They were fascinated by him, as they were the last time they visited, and I dare say the three became fast friends! And it's great to hear about so many of your mothers and post-pregnancy experiences/thoughts. I look forward to reading more in the future! you captured the complexities of the featured relationships so wonderfully, shinyung...and without missing a beat of the beauty of it all! i got your message and will be sending an email soon! Fabulous writing Shinyung! One of your best pieces yet. I have been following your blog for over a year now, maybe two. Your way with words is a wonderful talent. Reading this post made me cry, thinking of how my mother has done the same types of things for my sister. Like someone who posted earlier, my mother is not from Korea, but is an immigrant and much of what you wrote rings true for her. I wonder at the similarities. Anyway, thank you for sharing your thoughts. Your blog is a place I visit occasionally with curiosity on what poignant view of life you've written about. Your story reminds me of my own mom and dad. Although my dad isn't here anymore, the way they fussed over the house, food, and the baby are exactly the same. My mom stayed with me for two weeks after my first son was born, and for those times, my hands never dipped in the water except to wash myself and my son. Thanks for the story. Loved this post, Shinyoung! Email me!